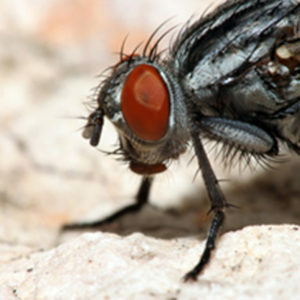 Name: Blow Flies – Calipohora sp, Lucillia sp, Sarcohpaga sp. Egg: Laid in bundles on or near carrion. Hatch within 1-2 days. Larvae: Grow to a size of 18mm, take up to 3 moults and on average reach their pupal stage within a week. Pupae: Pupa take 1-2 weeks to develop inside reddish brown cases. Adult: Adults emerge and can be as large as 11mm. With an acute sense of smell they actively seek carrion and can live for several weeks dependant on the ambient environment. The larvae are whitish in colour with no legs and hook like proboscis, growing to a size of 18mm. Pupa are a reddish brown and will usually be found away from the carrion in a dry environment. Caliphora – A metallic blue body. Lucillia – A metallic green body. Sarcophagi – A grey and black striped thorax with bright red eyes. The larvae are found anywhere there is carrion, frequently becoming pests of meat factories, slaughter houses or sites where there are dead animals (including rodent bodies). Larvae tend to produce ammonia when they moult giving carrion a distinct and unpleasant smell. Adults can be seen flying through the air. 1. The British Pest Management Manual. Section 5, pg 161. 2. Lab notes, Tarakan International.